IN LSAMP offers the opportunity for underrepresented minority STEM students to participate in a research experience. This has been identified as a key component in successful persistence in undergraduate STEM programs. IN LSAMP students may start with the program serving as a peer mentor (or committing to in the future) to prepare for the opportunity to become an IN LSAMP Research Scholar and to work alongside a faculty mentor on an original research project. The research scholars are eligible to receive financial support, funds for research supplies, and travel awards to present their research. The IN LSAMP Campus Coordinator works closely with students to match faculty research mentors and projects with LSAMP eligible students. Upper-level LSAMP Research Scholars are encouraged to apply to research experience for undergraduates (REU) programs at other universities during the summer. These opportunities may be fully or partially funded and are intended to broaden their experiences and networks. 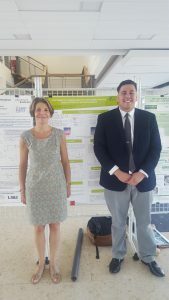 LSAMP Research Scholars are eligible for the NSF Bridges to Doctorate Program.